Audience Analysis Overview - In order to compose persuasive, user-centered communication, you should gather as much information as possible about the people reading your document. The Development Stage - Building Information About Your Readers? discusses your communication's complex audience and provides key questions you can ask to determine readers' needs, values, and attitudes. This section also provides useful charts to help you with your audience analysis. Genre, Audience, Purpose and Style - To be clear about the type of writing you are aiming for, you need to identify and understand four key areas - genre, audience, purpose and style. Make these part of your planning when you start to write a non-fiction text. Identifying an Audience - This handout provides detailed information about how to write research papers including discussing research papers as a genre, choosing topics, and finding sources. Listening to Safety Instructions - [Skillwise worksheet] Listen to safety instructions and identify the speaker, situation and audience. 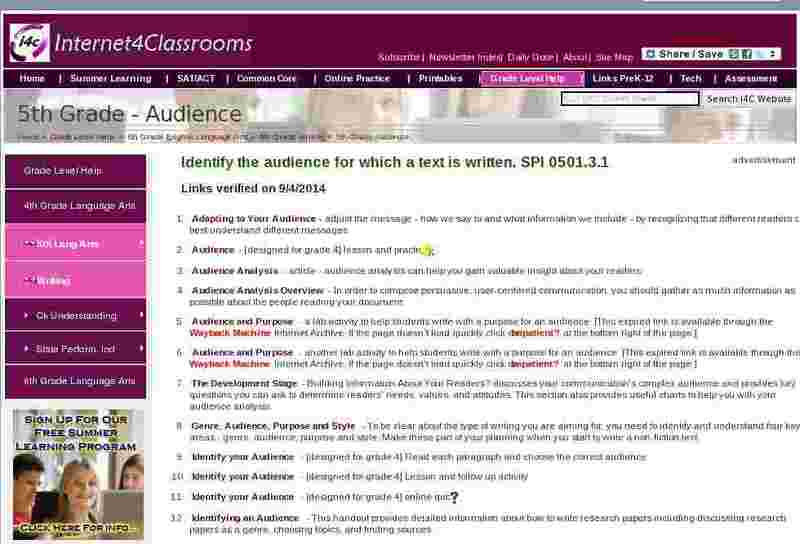 Reading and Action Stage - Building Information About Your Readers? discusses your communication's complex audience and provides key questions you can ask to determine readers' needs, values, and attitudes. This section also provides useful charts to help you with your audience analysis. The Rhetorical Situation: Audience and Text - This presentation is designed to introduce your students to a variety of factors that contribute to strong, well-organized writing. This presentation is suitable for the beginning of a composition course or the assignment of a writing project in any class. Tailoring Employment Documents For a Specific Audience - This handout provides information on how to tailor your employment documents to a specific audience. Teaching Audience through Interactive Writing - Lesson plan that can be adapted for this grade level (originally designed for K-2) - students work together to create a genuine invitation letter for a group of their peers. In addition to the interactive writing experience, students work independently to create invitation letters for their families. Writing for a North American Business Audience - This handout provides examples and information on how to write for a business audience. It includes information on getting to the point, keeping it simple, active and passive voice, nondiscriminatory language, and verb over generalizing.